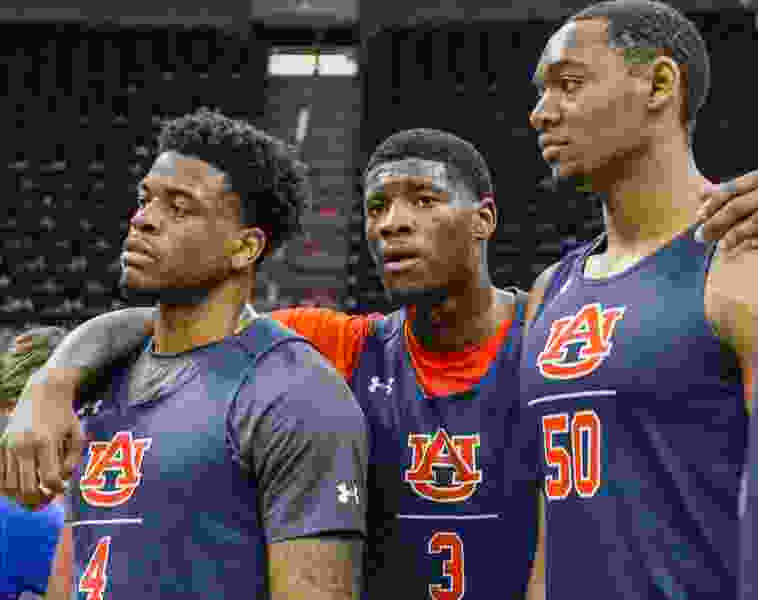 Leah Hogsten | The Salt Lake Tribune l-r Auburn's Malik Dunbar, Danjel Purifoy and Austin Wiley huddle after practice Wednesday at the 2019 NCAA Division I Men's Basketball Championship, March 20, 2019 in preparation for their first round game against the Northeastern Huskies on Thursday. Records: Auburn 26-9 (11-7 SEC); NMSU 30-4 (15-1 WAC). About the Tigers: Auburn has won eight straight games to earn a No. 5 in the Midwest Region. … The Tigers’ top scorers are guards Jared Harper (15.2) and Bryce Brown (15.8). … Auburn had gone 14 years without an NCAA Tournament appearance before last March, when the Tigers beat College of Charleston and lost to Clemson… Former Jazz forward Chris Morris’ 36-point performance in 1988 is an Auburn record for an NCAA game. About the Aggies: NMSU coach Chris Jans is 58-10 in two seasons, including 27-3 in Western Athletic Conference play. One of those losses came at Utah Valley last year. … Nine players averaged 5.0-plus points in WAC play, with guard Terrell Brown the only double-figures scorer (12.9). … Like Auburn, the Aggies lost to Clemson in the 2018 NCAA Tournament, falling 79-68 in a first-round game in San Diego.